This event is organized as a Middle East Studies lecture series event and cosponsored as part of the Watson Institute Security Seminar Series. Watch a series of interviews with Rema Hammami here. After Oslo, occupied Palestine became subject to new imperial modalities for the management of self-determination struggles in the post-Cold war era. These involved a large material and discursive apparatus through which Palestinian subjectivities could be brought under imperial tutelage through contemporary mechanisms of global governmentality as they relate to zones of conflict. The doctrine of “Earned sovereignty” became the larger political logic through which Palestinian aspirations became channeled into specific regulatory paths. In tandem was the entry of the vast assemblage of international institutions, NGOs and private contractors tasked with “state and peace building” under the terms of the liberal peace. Taken together these modalities over twenty years have produced an imperial trusteeship over Palestinians that rather than challenging Israeli sovereign power, works within it and simply mitigates some of its effects. Simultaneously, this process has been profoundly transformative of Palestinian subjectivities and forms of knowledge production. The presentation analyzes the unfolding of this process on the ground with a particular focus on its effects in terms of knowledge production around gender and the way it became contained within the discursive formations of developmentalism/ humanitarianism that is so crucial to these particular modalities of global power. 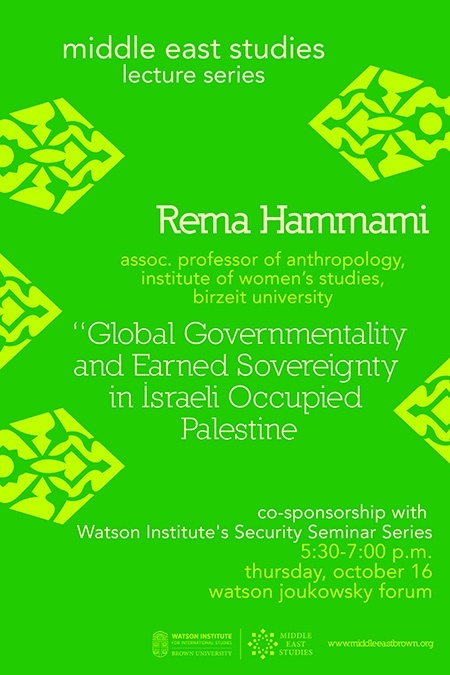 Rema Hammami is Associate Professor of Anthropology and founding member of the Women’s Studies Institute at Birzeit University, where she chairs the Graduate Program in Gender and Development. Her publications cover an array of issues as they relate to the Palestinian context, including: gender, nationalism and armed conflict; NGOs, politics, and civil society; and ethnographies of spatial control and resistance. She serves on the editorial boards of the Arab Studies Journal, Jerusalem Quarterly File, Middle East Reports and Development and Change. Founder and chair (2002-04) of the Birzeit University Right to Education Campaign and founder and executive director (1993-94) of the Women’s Affairs Centre in Gaza, she serves on the boards of the Palestinian Institute for the Study of Democracy (Muwatin); the Centre for Global Dialogue and Democracy (Miftah) and the Institute for Jerusalem Studies and is a jury member of the Prince Claus Awards for Culture and Development. Her recent publications include: Who Answers to Gazan Women? A study in security and economic rights. UNWomen: New York. 2011; “Home and Exile in Jerusalem” in Shehadeh, R and P. Johnson (eds.) Seeking Palestine: New Palestinian Writing on Home and Exile. Northhampton, Mass. : Olive Branch Press. 2013.